The Armenian Apostolic Church (AAC), which has long earned a reputation in the country as a fraudulent organization, is going through bad times. The reason is that Armenia’s population, which started protests two months ago in order to change the grave situation in the country, now protests against the leadership of the Church. Since its establishment, the AAC has literally been inviolable, and today the Church is an autonomous structure within Armenia, which adheres to its own laws and influences the lives of Armenians. However, the country’s population is obviously tired of the AAC’s current leadership, and therefore, people protest in Yerevan, demanding the resignation of the Catholicos of All Armenians Karekin II. YEREVAN, Sept. 24 (Xinhua) -- Armenia's ruling party won a stunning majority in its capital Yerevan's City Council elections Sunday, the Central Electoral Commission (CEC) said. My Step Alliance, which includes Prime Minister Nikol Pashinyan's Civil Contract party, garnered around 81 percent of the vote. This was Pashinyan's first electoral test since the former journalist and opposition MP rose up to the current post following weeks of mass protests that forced long-time leader Serzh Sargsyan to step down. Prosperous Armenia Party and Light -- an alliance of parties led by Justice Minister Artak Zeynalyan -- came in second and third, obtaining 7 percent and 5 percent of the votes, respectively. As a result, former comedian Hayk Marutyan, who has been leading My Step Alliance, is now poised to become Yerevan's next mayor. Marutyan was an early supporter of Pashinyan when the latter started his protest movement in April. According to the CEC, around 370,000 voters, or 43.65 percent, of around 850,000 people of electoral age cast their ballots on Sunday. (Armradio) – Karabakh must not be a part of Azerbaijan, unless one wants to trigger a new genocide of Armenian people, Armenia’s Prime Minister Nikol Pashinyan says. “The status and security of the Republic of Artsakh is an absolute priority of the Republic of Armenia in the negotiation process,” he added. “Armenia will continue its constructive engagement in the peaceful resolution of the conflict within the format of the OSCE Minsk Group Co-Chairs, which has the only internationally recognized mandate to deal with the conflict,” Pashinyan stated. Azerbaijan should change its behavior of disrespect towards the negotiations and abandon “the idea of any military solution and implement all the previous agreements. Furthermore, if Azerbaijan is truly committed to the peace process it should start talking to the main subject of this conflict – Nagorno-Karabakh,” he added. “Azerbaijan declares on every occasion that Karabakh should be a part of its territory. At the same time it announces that it will not negotiate with Nagorno Karabakh. The question is how Azerbaijan can make a claim over Nagorno-Karabakh without even speaking to NK? Is that possible? This is possible only if Azerbaijani government wants the territory and not the people,” PM Pashinyan said. “Thus, it becomes obvious that the intention of Azerbaijani leadership is to cleanse Armenians from Karabakh, like they did in Nakhijevan. This entitles Nagorno-Karabakh to make the argument, that to be a part of Azerbaijan for Karabakh means to be totally exterminated. Hence Karabakh must not be a part of Azerbaijan, unless one wants to trigger a new genocide of Armenian people,” Nikol Pashinayn stressed. Those political foes responded Tuesday by passing a bill intended to disrupt Pashinian's plan to disband parliament and call a new election for December. The bill must be signed by the president to become law. "We made the decision not because we don't want to face early elections, but because we can't accept pressuring lawmakers," parliamentary speaker Ara Babloian said. Pashinian called on his supporters to protest the move and several thousand quickly gathered outside parliament. Pro-Pashinian lawmakers blocked the exits to prevent his opponents from leaving the building. In a fiery speech at the rally, Pashinian assailed the Republican Party and its allies for what he described as the "counterrevolutionary" move. "They have waged a war against their people," he said. Pashinian told his supporters he would urge President Armen Sarkissian not to sign the bill into law. He also declared that he decided to fire Cabinet members from the two parties that joined the Republican Party in Tuesday's vote. After speaking to the demonstrators, Pashinian went inside the parliament building for talks with lawmakers. Some of the people attending the rally tried to break into parliament, shouting insults at the Republicans and their allies. Pashinian's predecessor, Serzh Sargsyan, shifted into the premier's seat in April after serving two presidential terms, a move seen as a maneuver to avoid term limits and stay in power. Pashinian, a former journalist, led a wave of protests fueled by public anger over the widespread poverty, high unemployment and rampant corruption that flourished under the old government, forcing Sargsyan to step down. "Political events have shown that we should hold snap parliamentary elections very quickly because political uncertainties are preventing new investments in our economy,” Pashinyan saidthe day following the Yerevan elections, in which his slate got 81 percent of the vote. “I believe that these elections also showed that the current parliament does not in fact have a mandate, because the parliamentary forces have collected very few votes." Artsakh war veteran Arayik Khandoyan (aka Lone Wolf), a member of the Sasna Dzrer group that seized a Yerevan police building in 2016, died today after apparently suffering a heart attack. Hetq received the news from Khandoyan’s compatriot Varuzhan Avetisyan, who learnt of Khandoayn’s death from friends who had gathered in a Gyumri hospital where Khandoyan passed away. 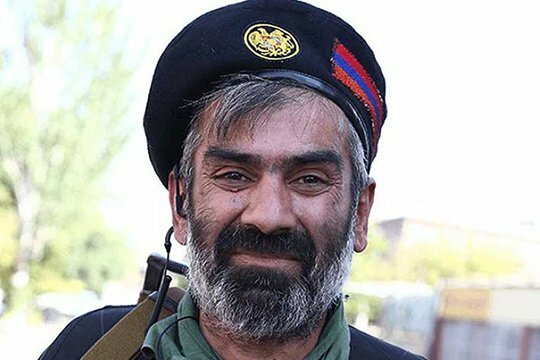 Khandoyan was released from detention on August 17 while his trial, and that of other Sasna Dzrer members, was ongoing. Gagik Tsarukyan, who heads the Prosperous Armenia Party (BHK), has promised not to nominate a candidate for the post of prime minister, or to support any candidate, if Prime Minister Nikol Pashinyan resigns to allow for snap parliamentary elections. Armenia’s Prosecutor General’s Office (PGO) has launched a criminal case regarding the construction of the Yerevan private home belonging to former Syunik Provincial Governor Surik Khachatryan. The PGO investigated the matter on the basis of an August 24 Hetq article stating that while Surik Khachatryan has been building a three-story house, on 2,000 square meters of land owned by him in Yerevan, for more than 10 years, he got a construction license only recently, on June 8, 2018. The investigation revealed that Yerevan Municipality employees were lax when following the appropriate construction laws. Charges of “abuse of official authority” have been filed. Armenian Prime Minister Nikol Pashinyan has resigned in an attempt to force an early parliamentary election. Armenian Prime Minister Nikol Pashinyan said on Tuesday he was resigning from his post in order for parliament to be dissolved and an early election held. The PM announced his resignation live on national television. The former opposition leader swept to power in May following weeks of protests that forced the resignation of his predecessor.